The Tommy Gate hydraulic tailgate lift, named after the creator’s son ‘Tommy’, was first manufactured in 1965. 40 years on, the Tommy Gate Company has gone from strength to strength, with a huge factory in Woodbine, Iowa United States. It is there that all the world’s finest lift gates and tailgate loaders are manufactured. Tommy Gate offers a full line of tailgate lifts for any personal, commercial, or industrial application. Depending on your particular cargo-handling needs and your vehicle, certain lift gates may be more suitable than others. 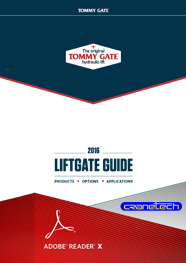 The downloadable guide right of the screen is intended to help you most easily identify which Tommy Gate hydraulic tailgate lift is right for you. For more detailed information on the range of Tommy Gate products or to request a quotation please feel free to contact one of our sales team.